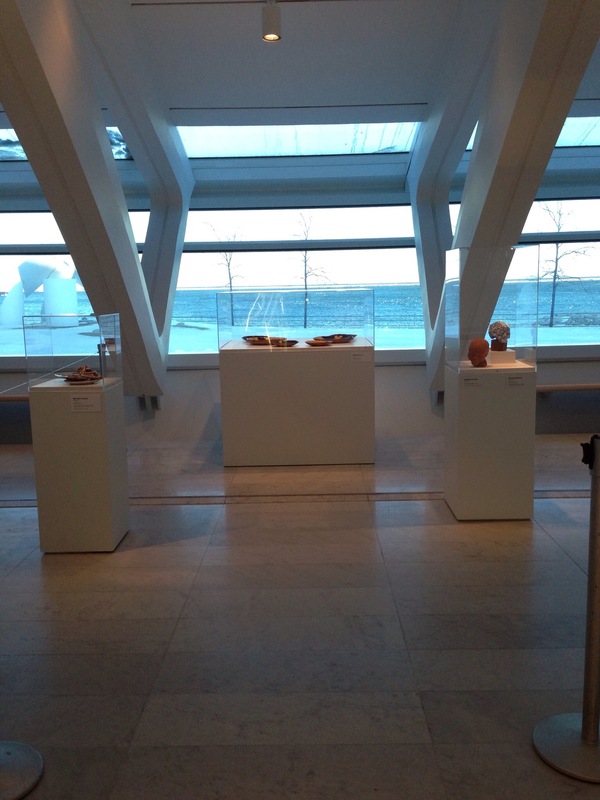 Flow: The 2014 NCECA Ceramic Arts Invitational is currently on view at the Milwaukee Art Museum. The space is stunning with a wall of windows facing Lake Michigan and spacious with nearly 8,000 square feet of space. A long corridor that connects the main lobby or Windhover Hall to the museum proper, the Baumgartner Galleria is now a meander of ceramic delights and challenges. Curated by Linda Ganstrom, NCECA Exhibitions Director and Mel Buchanan, NCECA On-Site Liaison, twenty artists are featured in Flow, an exhibition conceptually centered on the physical property of fluid movement. The exhibition functions as a centerpiece of the 2014 NCECA conference theme, Material World. Enriching the literal interpretation, the selected works connect to the theme of flow; symbolically, esthetically and historically. While ceramics normally sits still and stays on the pedestal, a number of works in Flow actually move. As you enter the gallery, City by France Goneau, gently flutters in the air currents. 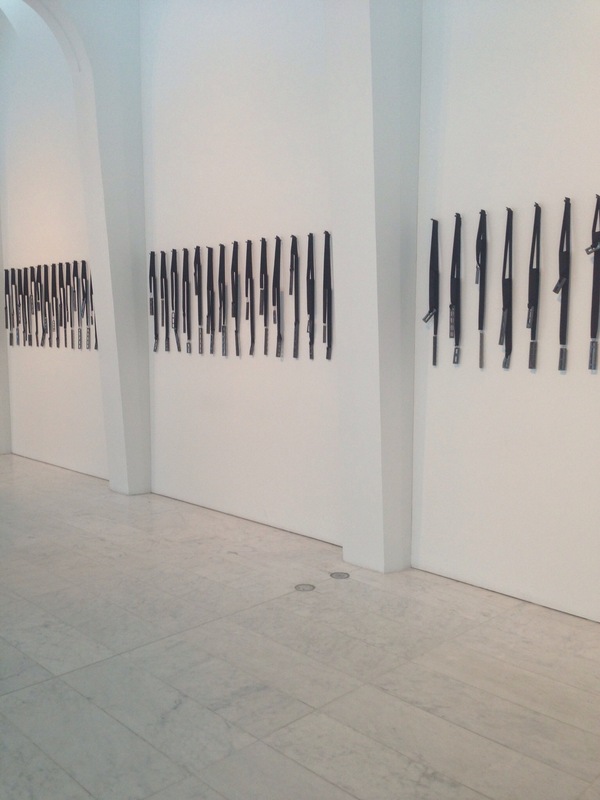 At first read, City has a piano keyboard rhythm as it stretches over 30 feet across the gallery wall. As you move closer, you notice small ceramic bricks, the building blocks of many cities, carefully suspended on grosgrain ribbons. Up close, you see hand stitching evoking a sense of feminine labor, then notice that the bricks and their supporting ribbons are balanced on ribbon loops. As you back away your eye flows from the dark ribbons and the white negative space becomes a cityscape. 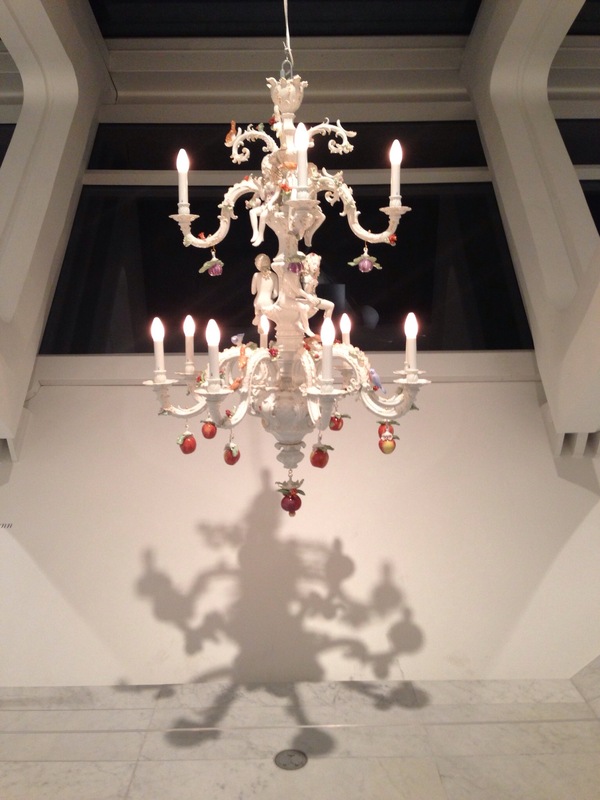 Chris Antemann’s Paradise Chandelier created at Meissen ever so softly twirls near the windows of the Baumgartner Galleria, its twinkling lights beckoning the viewer further into the space. Using molds originally created by 18th century, Meissen Master, J. J. Kaendler; Antemann added luscious fruit and her distinctive couples to the installation. Originally designed for European palaces and great houses, the chandelier now appears quite at home in one of the great art palaces of our age, available for the enjoyment and pleasure of the general public. 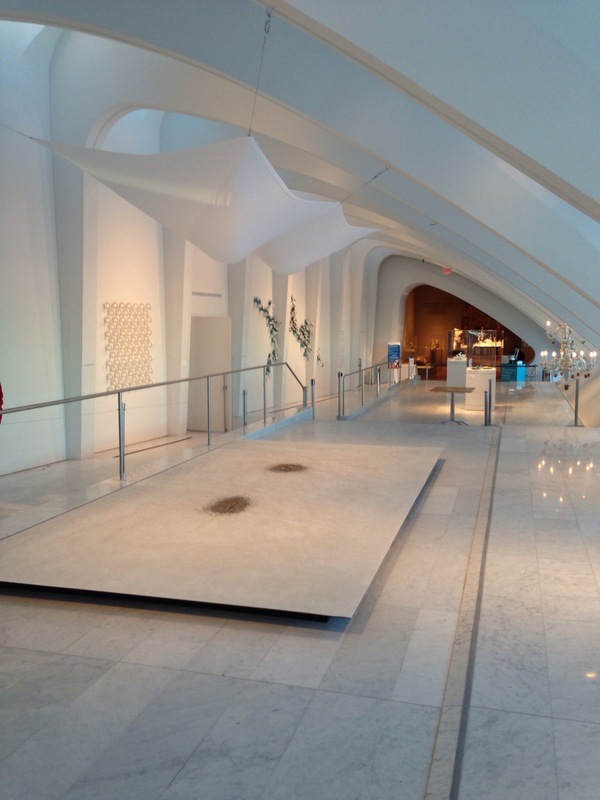 Seep by Linda Swanson releases tiny droplets of water onto an soft earthen carpet formed of bentonite, salt and red art. Each drop sculpts and paints a tiny landscape. As the puddle enlarges, then dries and recedes, the work is constantly changing. Symbolically, we become the drops that interact with our planet, changing it and ourselves. Seated on a bench near this installation, one is invited to relax, slow down, and observe the evolution of the piece and its changing geology. Just as a Rothko painting draws the viewer into its abstraction, Seep encourages the viewer to enter a world of texture, color, action and inaction, in a quiet, artistic and possibly spiritual experience. 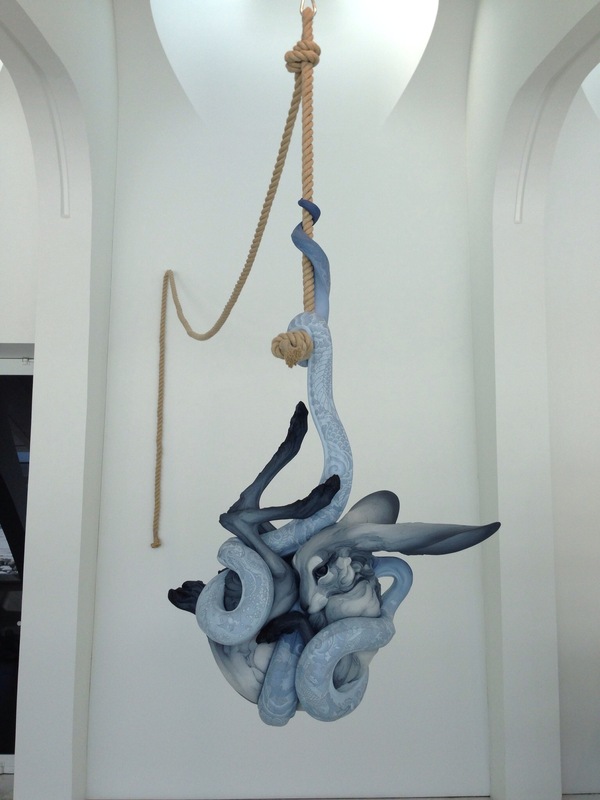 Tangled Up in You by Beth Cavener hangs suspended, in the center of the space, gently swaying. Gripping a thick rope, the snake strives to consume a large captive hare depicting a conflict with no resolution, a psychological state powered by tremendous emotion. Elegant tattoo patterns illustrate this story of conflict, striving and beauty on the skin of the snake in subtle blue on blue, adding to the watery aesthetic. Requiring the intent viewer to follow the muscular movement of the snake around the tortured hare to read the tattoo, the careful observer is rewarded with secret insight as they decipher the poetic symbolism. Del Harrow’s Air_Breath employs computer generated motion graphics in his installation. Beginning with a scan of a Sung dynasty bottle form and a British apothecary jar, Harrow studied the many permutations between the two forms as seen in the large delicate mechanical drawing and finally in the series of slipcast vases. 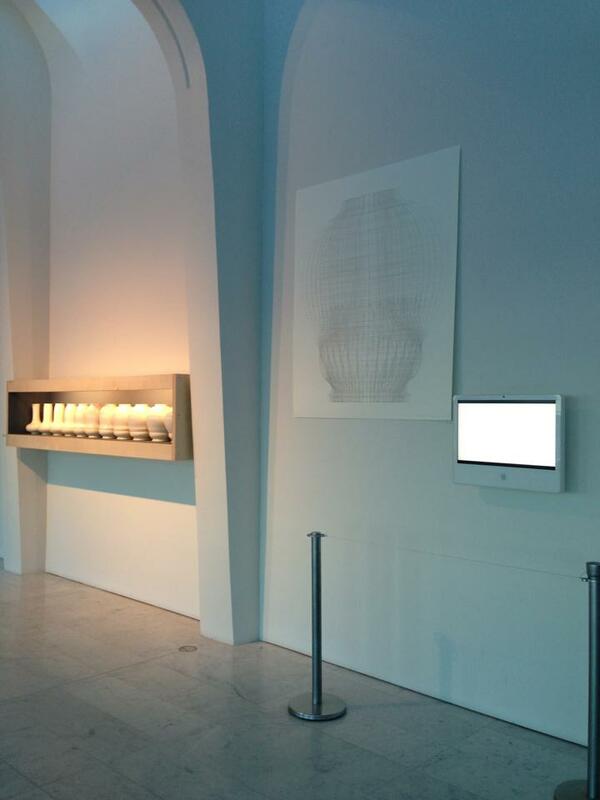 The video screen clears depicts the breath of the pot as the silhouette moves between these two iconic forms.